Britain’s vote on EU membership tomorrow (23 June) has produced a lot of emotional polemic, and very little dispassionate analysis. I was persuaded yesterday to click through to this article by Professor Alan Johnson (not to be confused with his namesake, the Labour politician) on the basis that “it was the most compelling case for Leave that I have read”, to find that it was anything but compelling, as it jumped off from premises that are highly flawed in my eyes. And it made no real attempt to persuade people of an alternative view either. Of course, I am guilty of polemicism too, for Remain. But I try to stand above such things, as well. So on the eve of the vote I will assess the arguments that I think hold water. I will do this based on the three substantive arguments for Leave: that the EU project is fatally flawed; that free movement of people within the union is too high a price to pay; and that rejecting the EU would give a needed shock to the country’s political and economic system. I will then say something about the benefits of EU membership. First is the flawed nature of the EU project; this lies at the heart of Professor Johnson’s case. What is the EU? It is an association of sovereign states that have agreed to bind themselves by treaty to hold to common standards in a wide variety of areas, to act jointly in others (most importantly in trade negotiations), and hold the whole thing together with a system for developing common policy and resolving disputes. Some of the Union’s founders saw this as an intermediate stage towards a United States of Europe, on a similar basis to the USA, and some of the language of the treaties (“ever closer union” ) was drafted with that aim in mind. But it lacks the wherewithal to make such a transition without the consent of the peoples of the member states. Unlike the early USA, there is no federal army to bring dissenting states to heel. Nor can there ever be. But that leaves the project with some serious problems. Staying within the Union binds member states to a whole series of standards on a take it or leave it basis. Individual countries have little ability to opt out of the bits not to their taste – just opting out of the whole shebang, as Britain now contemplates. That is because it is a carefully balanced whole, and opt outs would be seen by other member states as trying to gain an unfair advantage. But it isn’t very democratic. Much ire is raised by, for example, the way Irish voters have been bullied into accepting treaty changes in spite of initial rejection (Professor Johnson aerates about this). But neither is it democratic for Irish voters to impose their will on all the other member states. This leaves a dilemma at the heart of the project. If you want to make the EU more democratic and accountable, you have to make it look like a more conventional state, taking decisions as a whole union, reducing the autonomy of individual states. If you allow member states to vary treaty terms at a whim, then the whole project collapses. This dilemma is at its most acute with the imposition of a common currency – which, of course, does not include Britain. Its implementation has been flawed, leading to ugly disputes between debtor and creditor nations. Many say that the only way to make the currency workable is to promote political integration. I don’t happen to agree with this, but further integration of the Eurozone could make Britain’s status within the union untenable – but we haven’t got there yet, and can act accordingly if we do. There is really no easy answer here. You have to weigh the benefits of joint action against the losses to autonomy. I will come back to those benefits, but there is one clear area of lost autonomy that upsets a lot of people: free movement of people. Free movement: too high a price to pay? Our rights within the union to travel to and work in other member states mean that member states have little control over immigration from other member states. Very large numbers have come to Britain from other EU countries, especially the new states of eastern Europe. This is not Britain’s biggest immigration issue – which comes from other migrants, who are more numerous and who integrate less easily – but there is a feeling among many that Britain is “full”, with excessive stress on housing and public services. Many Britons, especially less educated ones, sometimes feel like foreigners in their own land as they pass through districts settled by people of foreign origin. There is little evidence that European immigration has caused pay levels to fall, but it may have stopped wage rates in some jobs from rising. Leaving the EU, and its single market, would allow Britain to put quotas on migrants from all sources. This would be popular amongst most of the population. It is Leave’s most powerful argument. The main counterargument is that this would either make less difference to migration than most people suppose, or cause even more stress to services than it saves. Unemployment in Britain is low. Jobs are being created as fast as migrants come in to take them up. Our workforce is shrinking as more of us retire. So if those migrants did not come, who how would be find people to do the jobs that need doing? The government would be under huge pressure to let the migrants keep coming. We can see that this has happened for migration from non-EU countries – which the government has tried to limit, but which remains high. There are other arguments. The rights of Britons living in other EU countries (and there are many) would be endangered; the system for administering immigration (an Australian-style points system has been suggested) would be a bureaucratic nightmare; there may be an intractable problem on the border between the Irish Republic and Northern Ireland. And would the politics of immigration controls make the country a less tolerant and open-minded place? It’s messy, and it comes back to the same balance between the benefits of autonomy over the benefits of being part of the union. There is also an angry argument. This says that Britain’s governing institutions have become complacent and need to be shaken up. There are two groups of complaints, which are not necessarily consistent with each other. One is that the “elite” ignore the social and economic tensions in communities outside the metropolitan South East of England (or devolved Scotland). A second, from businessmen, is that they are overregulating the way we live and work, and holding back creativity; nothing much is being done to rectify a large trade deficit. There is substance behind both of these complaints. And a vote to leave the EU would constitute a massive institutional shock. The trouble is that the results of that shock are incalculable. The British trade and government deficits leave the country vulnerable. A prolonged period of political and economic uncertainty would be extremely damaging. ; it is not inconceivable that the country would have to call in the IMF, and face economic conditions much more severe than anything the EU imposes. And who would take political control in the wake of a Brexit vote? It really depends on how much risk you are prepared to run, and how likely you think that what emerged on the other side would be better than what we have now. A decision on which way to vote may be affected by a worries about the short-term chaos that may or may not arise from a vote to leave. But the main factor behind any decision must be a view on the longer term benefits of the union – to weigh against the loss of national autonomy. There are three important ones: the single market, extended personal rights, and the Union’s political project. The single market is the most talked about of these, and the most important – it was why, after all, that Margaret Thatcher was initially happy with the trade-off, though she changed her mind later. The important point here is that in order to have a true single market, in which businesses can sell to each other across the union on a playing field that is rather more level than otherwise, you have to go way beyond the absence of tariffs – which is implied by the idea of a “free” trade area. Barriers to trade are about much, much more than this. It is about standards, regulations and subsidies. Is it fair that one country can undercut another through lower environmental standards, inhuman working conditions, or state subsidies? But addressing these issues is intrusive. Most of the power of the US federal government arises from its constitutional power to regulate interstate trade. The EU single market is an imperfect compromise, inevitably, but it has taken the idea much further than any other association of sovereign states. The economic studies I have seen have shown that it has largely worked. Trade between the EU states has increased massively since the single market was developed (and not by diverting it from the rest of the world) – it has been much more effective in this that the single currency, which has had little measurable impact. There is bound to be a significant economic cost to withdrawing from it. It makes Britain a much riskier place to build a car factory, for example. This is why economists and businessmen so overwhelmingly support staying in. The Leave campaign have resorted to quoting the same two: Andrew Bamford and James Dyson over and again; Remain can call on hundreds. A second benefit is extended personal rights. We get these when we travel abroad, and, especially, when Britons live or work abroad. These are imperfect, of course, but life is much easier for us than, for example, for Australians. This will be irrelevant for those that don’t travel – but many of us do, if only to holiday in other EU countries. A third benefit, on the other hand, is very indirect: the EU’s political project. This has been to spread the standards of democracy, the rule of law and good governance across the continent of Europe – to say nothing of making warfare amongst the nations unthinkable. From its initial core of countries the union has been the leading force in democratising first southern Europe, and then post-communist central and east Europe. This is reaching its limits. New members may be brought in from the former Yugoslavia and Albania, but Turkey and Ukraine look like steps too far. More important, there is much work to do to consolidate democratic standards in the post-communist members, especially in Romania and Bulgaria, but in most of the others too. This worthy project would be weakened if Britain left, even if we individually feel little impact. Closer to home the EU has also a vital part of the fudge required for the Northern Ireland peace settlement to stick; leaving would add to the already big headaches there. I was going to mention the host of spurious arguments that have been put up in the campaign, mostly be the leave side (such as the one about the EU’s economy being weak, as if that would not be just as much a problem if Britain was out of the EU), but I’ve been going on for long enough. It will be clear from the above that deciding the best way to vote means making some tricky judgement calls, balancing the costs and risks either way. This does not mean that the choice is marginal or unimportant – it would make a big difference to what this country becomes. In these tricky circumstances we are guided by value judgements. If you are angry about the restrictions European treaties place on our politicians, that will point you towards Leave. If you are reasonably happy with the status quo, and want any change to be gradual, that points to Remain. If you feel that in order to make our way in an interconnected world the countries of Europe need to take joint decisions; if you are happy with the idea of Europe as an extension of “home”; if you don’t mind that so many of your neighbours are from other European countries; then that points to Remain also. Which doesn’t mean that you should be happy with the way things are, but that Britain leaving the EU would be a step backwards, not forwards. And me? I was just to young to vote in the 1974 referendum – but I was a very keen supporter of Britain’s membership at the time. It has been a defining part of my political outlook ever since. I wanted to be part of something bigger than Britain, much though I love it. I still do, though I have fewer illusions about what is going to be possible. So for me voting Remain was an easy decision. For most of my compatriots it may not be. It is quite likely that the British public will vote to leave the European Union this week. Supporters of staying in are left with straws to clutch at. Perhaps the pollsters have overestimated the propensity of less educated Leave supporters to turn out and vote. Perhaps the awful murder of Remain supporter Jo Cox MP will give people pause. Polls show that there may be a modest swing back to Remain, but the political momentum behind Leave still looks formidable. But the consequences of a vote to leave are incalculable, not because the aim of leaving the EU is necessarily so awful, but because Britain’s governing institutions are so unready for the consequences of the vote. This shows the limits of the referendum as a means for governments to consult their electorates. Referendums work best when the electorate is offered clear and coherent alternatives. This is only likely if the government of the day is recommending a change from the status quo; it is clearly going to be accountable for the change – while the status quo is what the public and governing institutions are familiar with. This is what happened in 2014’s referendum on Scottish independence. In that case the Scottish government ( though not the UK one) set out a prospectus for independence, and it was clearly up for leading the country through the transition process. A referendum proposal that had been cobbled together by members of the public without the support of major political institutions would have been a wholly different thing. The EU referendum does not fit the bill. It was designed by David Cameron’s British government to make his Internal Conservative critics, who passionately oppose the EU, go away. But nobody has formulated a clear prospectus for life outside the EU; instead a number of half-baked and irreconcilable alternatives are advocated (characterised in an earlier post of mine, as following Singapore, Switzerland or Japan), and it is far from clear which the public is being asked to sign up to. And exit does not command a parliamentary majority, still less any of its particular versions. A Brexit vote would create political chaos. And, given Britain’s dependence on trade and external finance, this political chaos threatens economic chaos. It is the lack political leadership, more than the exit proposition itself, that threatens the country’s economic stability. This was illustrated by the Chancellor of the Exchequer, George Osborne. Last week he suggested that a Brexit vote would have to be followed by an emergency budget, driving through austerity measures as government revenues fell with the economic shock. This was clearly a stunt, which convinced few – even those, like most economic forecasters, who accept that Brexit would put government finances under pressure. And yet many Conservative MPs immediately said they would reject such a budget, and they were joined by the Labour leader Jeremy Corbyn, who rejects all austerity ever. This presents the prospect that there is no working parliamentary majority for any given way forward. Neither is it clear from where any such parliamentary majority would emerge, even if there were a general election. There might even have to be another referendum to resolve the constitutional deadlock. So it is not hard to imagine that a financial crisis could follow a Brexit vote. Inward investment would halt to see how the dust settled. Sterling could dive as a result, and the government could start finding it hard to fund the National Debt, with the still considerable budget deficit, as it loses its status as an international safe haven. Creating new money to fund the debt may solve the short-term crisis, but only at the expense of harming the country’s longer term financial standing. Britain has a large current account deficit, meaning that it depends on flows from abroad – a key point of departure from the inveterate money printer, Japan. This could be worse than the financial crisis of 2008 to 2010; the deficit may be smaller, but overall debt is larger, and political leadership then was clearer; indeed this was the most compelling logic behind the Conservatives forming a coalition with the Liberal Democrats in 2010. In due course the British government might have to call in the IMF to stay afloat. Something like Mr Osborne’s putative budget might then follow. The irony than an attempt to become independent of EU institutions led only to becoming dependent on the much more intrusive IMF would be bitter. I happen to think this sequence of events is quite likely if Britain votes to leave, though many would consider it absurd given how easily the country floated through the earlier crisis of 2008 onwards. But what is unarguable is that the lack of political leadership on the Brexit side, with no clear political accountability for any Brexit result, makes this outcome more likely. This is the wrong way to leave the EU. What should happen is that one of the main parties puts leaving the EU in its election manifesto, gets a majority, and then takes the proposal to the country in a referendum. If it wins, it is clearly responsible for the consequences. Curiously enough, in today’s grumpy politics, the lack of a clear prospectus, and the threat of political chaos, seem to be no disadvantage to the Leave side in the referendum. Indeed it adds to an anti-establishment appeal. There seems to be a curious death wish at large. The leaders of the Leave campaign thrive on their power without responsibility, seemingly relishing a ringside seat in the chaos that would follow. Mr Cameron’s judgement looks poor in getting us to this dismal point. And yet what could he have done instead? His big mistake was his attempt to lead his party to a place it did not want to go. The most honest thing for the Conservatives to have done would have been to elect a leader that was explicit about leading the country out of Europe. If they had done that, then Gordon Brown might still be Prime Minister, but the politics would have been more honest, and the risks to nation fewer. Yesterday I spent most of the day helping my local Liberal Democrats in the Tooting by-election. Alas there was little to show for it as the two main parties steamrollered all the others; we hope to have built something for the future. But that, of course, is not what prompted the title of this article, though it hardly helped. During the day a British Labour MP, Jo Cox, was shot and killed by one of her constituents while she was holding a surgery. This comes on top of week where English football fans exhibited shocking, loutish behaviour at the European Championships in France, and in the EU referendum, the Leave campaign took a firm lead in the opinion polls, as it sank to new lows in ad hominem attacks and the raising of irrelevant fears. This included a poster showing refugees modelled on one devised by Goebbels in Nazi Germany. I did not know Ms Cox. Her murder has shocked the political establishment, and she has drawn eulogies from across the political spectrum. Her attacker seems to have taken exception to her internationalist outlook, be it support for the Remain campaign or helping refugees from Syria and elsewhere. I, and many of my friends, are linking these depressing events. The Leave campaign is riding on the crest of a public backlash, especially by older, less-educated English white males , against the political establishment. Immigration and Muslims are their subjects of choice. Political correctness is condemned. As this movement gathers momentum, people feel free to indulge in all manner of rudeness in the cause of “putting Britain first”, by which they usually mean England. This is a far cry from murder, maybe, and I’m sure that Leave campaigners are as shocked as anybody else, but the fire they are playing with reduces the psychological barriers to violence. And it is leading nowhere good. A Leave result next week will provoke political chaos – and perhaps economic chaos too, according to the FT’s usually sober Martin Wolf. The paradox is that the aggressive anti-world, anti-establishment campaigning of the Outers leaves the country ill-equipped to deal with the consequences. While some Leave campaigners hope for a confident Britain making its way in a world without its horizons limited by the EU, it is not this which is giving their campaign traction. The country will enter one of the most politically and economically challenging periods of its recent history virtually leaderless, and with little sign of where any coherent leadership will come from. And the world is not nice place at the moment. The week started with the shocking massacre in Orlando. Xenophobia is rising in the rest of Europe. The peoples of the Middle East are helplessly mired in conflict. And that is to say nothing of the self-indulgent nationalism of Russia and China who feel take no responsibility for making the world a better place except for their own ruling elites.. Still I hope that enough British Leave supporters will draw back at the last moment, after gaining a sense of the abyss into which they may push our country, and stay at home or perhaps event vote the other way. It is but a faint hope; deep down I think things are going to get worse. And the consequences of even a narrow remain victory look difficult. At times like this my habit of political optimism is very hard to sustain. And yet we must keep trying for better. Britain after Brexit: Singapore, Switzerland or Japan? What would Britain become if it left the EU after the Referendum on 23 June? To most campaigners for Leave this may seem an unfair question: they are not a government in waiting. To them EU membership is inherently bad, and we should sort out what the country is to become one democratic step at a time once we have decided to leave. But to many Remainers it is the lack of a coherent and convincing alternative vision for Britain that is one of the strongest reasons for staying in the EU. So it helps to think it through. One way of doing that is to look at the example of other countries. One of the early alternative visions put forward by Leave advocates was Singapore. This is especially popular amongst businessmen. Singapore broke free from the Malaysian Federation in 1965 (it was expelled) and has prospered as an independent state. It now counts itself as part of the developed world, unlike the continuing Malaysia, which has advanced not nearly so quickly. Singapore made itself an easy country to do business in, and developed as a trading entrepot through, for example, very efficient port facilities. Meanwhile Malaysia became bogged down with the politics and corruption of a larger state, notably engaging in the politics of ethnicity. Likewise Leavers say that Britain is bogged down with the politics and inefficient regulation of an entity that is too big and complicated to be efficient. Why can’t we be something nimbler and more entrepreneurial, like Singapore? There are many problems with this idea, of course, which is no doubt we don’t hear so much of it now. First is that in size and complexity Britain looks more like Malaysia itself, rather than Singapore, while the EU looks nothing like the Malaysian Federation, with its autocratic leadership. The second is that Singapore is run very autocratically itself: a firmly-led one-party leadership forces through its pro-business agenda in a way that Britain’s government can only dream about. What stops Britain from being like Singapore is less the restrictions of the EU, and more its own raucous and vibrant democracy. A common complaint of Leave campaigners is that the EU is not democratic; following the example of Singapore suggests that it is in fact too democratic. Enter a second possible exemplar: Switzerland. Switzerland is prosperous and European; it is also probably the most democratic country in the world. Referendums are a very regular occurrence; Swiss people are constantly consulted. And they rejected joining the EU (and the EEA, a diluted version that includes Norway) exactly because it threatened its democratic standards. But the Swiss example throws up a couple of interesting problems. First, the country has found that the only way to make a proper democracy work is through a level of local devolution that is alien to Britain’s freewheeling ways. The central government is weak; most of the action occurs at cantonal level. This level of local government is actually quite intrusive; woe betide anybody that runs their washing machine late at night. A number of years ago many London firms threatened to migrate to Geneva in reaction to intrusive financial regulation; they did not follow through as their staff found the city a difficult place in which to live. Well that is more interesting than a decisive argument over Britain’s choices. It may show that many Brexit campaigners have mixed feelings about democracy, but Britain can still choose to runs its affairs differently. The second problem is more difficult: in order to prosper, Switzerland has found it necessary to participate in EU structures to secure its part in the single European market. It must comply with many EU regulations, allow the free movement of EU citizens and even pay into the EU budget. There is a tension between these things and Switzerland’s democracy (especially over allowing EU nationals in to work), but Switzerland has been forced to compromise. The Leave case to the voters is based heavily on stopping the free movement of people and on stopping EU budget contributions; it follows that the country could not follow the Swiss compromise, and would sacrifice much of its prosperity as a result. Indeed the Swiss compromise makes little sense – why not accept the EU structures and participate in their management in a way the Swiss are unable to? it is not as if we have such democratic traditions to protect. Indeed we might find some of the European structures useful to protect our citizens from our own government, elected with very unconvincing democratic mandates. I think a third exemplar fits much more closely with where Britain would head if it left the EU: Japan. Japan is an island nation positioned just off a continent with which it has difficult political relationships. It values social cohesion beyond economic prosperity, which means that it maintains strict controls against immigration, even though its aging population is creating a crying need for younger workers. It would rather seek solutions in robotics. It is democratic, though not in the free-wheeling way that Britain has become used to. But a post-Brexit Conservative Party could establish the dominance that Japan’s Liberal Democratic Party has achieved. The result would not be the business-friendly wonder of Singapore, but an even denser thicket of regulations and bureaucratic meddling than Britain has now, which helps to preserve social cohesion and stability, and protect the interests of established major businesses. In principle I think most of Britain’s voters would settle for this, even as they might moan (the Japanese do that too). The problem for Britain is that Japan’s economy is based on a strong industrial base. This is a historical oddity that would be very hard for Britain to replicate starting from where it does now (though would perhaps have been feasible starting from where it was in the 1950s). The businesses at the core of Japan’s success are mature ones, like Toyota, which has become the world’s leading motor manufacturer, alongside Germany’s Volkswagen. These businesses are not growing – indeed Japan’s economy has been in the doldrums since the 1990s, but they nevertheless provide Japan with financial security. Japan’s government is not dependent on foreign investors as Britain’s is. To replicate Japan’s success would require a rebalancing of Britain’s economy, led by a substantial devaluation of the pound, and several years of pain as living standards were squeezed. Are Britons really up for this? The country has already advanced far further down the road of multiculturalism than Japan could conceive of – a legacy of its Imperial history rather than of EU membership. Britons have got used to their holidays in the sun, and the country’s relationship with its continental neighbours has always been more integrated than that of Japan’s with China and (to a lesser degree) Korea. But if Britain votes for Leave – which is having the better of the referendum campaign so far – they may find themselves following the Japan road, with much less benign results than Japan has been able to achieve. That is a good reason to vote Remain. Posted on June 8, 2016 Author MatthewCategories Politics UK, WorldTags Britain and Europe, EU referendum, Japan, Singapore, Switzerland2 Comments on Britain after Brexit: Singapore, Switzerland or Japan? Brexit is winning the referendum campaign: what should Remain do? I have been following British politics remotely for the last two weeks from Cuba, where I was on holiday, and where internet access is limited, even in international hotels. The EU referendum campaign seemed to be going well for Remain. A rash of polls after a bit of a famine showed them winning by about a 10% margin. But as I arrived home yesterday I was in for a bit of a shock. First (hat-tip to politicalbetting.com – an excellent source of news on polling) any swing to remain shown by those polls was illusory. It came from the fact that most of the new polls were phone polls while those before them (showing a neck-and-neck result) were online polls; the online polls hadn’t budged. One of the curiosities of the campaign from the start is that phone polls have shown a distinct bias to remain (or online polls to Brexit, if you prefer). Then came yesterday’s shocker from ICM/The Guardian, which showed a 10% lead for remain being morphed into one for Brexit for 4%. And that was a phone poll. Interestingly the evidence from ICM’s online polls (and a new online poll today) suggests that this movement is more to do with the phone bias disappearing than with a wider swing in sentiment. But since optimists like me had assumed that phone polls were more reliable, that is no comfort whatsoever. My best guess is that Brexit now have a lead. That is more than worrying. Why? Well it’s nothing to do with my social circles, including those on social media, who continue to convince themselves that Remain is the only intellectually viable option, and pour scorn on the antics of the Brexit campaign. Unfortunately this is not the decisive battleground, and all the that sneering is probably not helping to convince the small numbers of Leave sympathisers and don’t knows that lurk in those circles. Brexit seems to have a decisive lead among the working classes, especially its ethnically white members, and in places outside London and its hinterland, and Scotland. The Leave campaign seems to be well targeted here. Its early appeals to the intellect, around parliamentary sovereignty and an appeal to British history, have fallen flat – but the campaign has majored on two undeniable facts. First is that the taxpayer makes cash contributions to the EU; the £350 million a week repeated relentlessly by the campaign is a lie, but how much of a lie remains arguable – it is before an agreed discount (the “rebate”), and spending by the EU within Britain on farm subsidies and the like, which it is said could or should be spent on different things. This enables the campaign to suggest many alternative ways this money could be spent, with the NHS top of the bill, to appeal to working class voters. It makes no difference that most Brexit politicians are enthusiastic supporters of austerity cuts, or that they assure farmers that the spending by the EU would be replaced by similar spending by the UK government. The first rule of political argument is that you never have time to explain. The second undeniable fact used by Leave is that membership of the EU includes freedom of movement, which allows people from other EU countries the right to live and work in Britain. That implies that leaving the EU would allow Britain to restrict immigration from other EU countries. Since immigration is popularly blamed for a wide variety of social ills, including stagnant wages and job insecurity, as well as high property prices and rents, and stretched public services, this is a powerful argument indeed. Cleverly today Leave campaigners proposed an “Australian style” points system to limit immigration. This moves the campaign from histrionic hand-waving to a seemingly sensible policy proposal from a government-in-waiting – just what Remain campaigners say that Leave couldn’t do. Even more cleverly, Leave campaigners are able to weave in fears about illegal immigration (some Albanians were caught trying to cross the Channel this week) and the refugee crisis in south Europe, even though these have nothing to do with Brexit, and might even be made worse by it. That libertarian Tories are signing up to an immigration policy based on bureaucratic central planning is one of the many paradoxes in the campaign. So what should the Remain side do to neutralise this effective campaign? I can see two possible approaches. One is “no more Mr Nice Guy”, and the other is “keep calm and carry on” – in other words by copying Leave’s tactics or playing their opposite. Playing both strategies at once is possible too, but risky. How might Remain copy Leave’s tactics? They need to start with some undeniable facts. What might these be? The most powerful is that all Britain’s trading relationships will have to be renegotiated by politicians and civil servants that have largely forgotten how to do it, and who would be overwhelmed by the task. This is bound to disrupt trade and investment for the short term, and it would surely create permanent damage too. Remain have tried to use this fact by way of warnings from authoritative figures and financial estimates of the impact on working families from economists. This has to be taken down market with visual images of redundancy notices and pay cuts – as well has trying to create more direct images of the scale of disruption involved (the number of treaties that would have to be negotiated, how long it would take, by how many negotiators, etc.). Remain have been accused of running a negative scare campaign – this strategy would mean living up to that description. But would that be playing into Leave’s hands? The alternative is to keep pumping out the vaguely positive and reassuring images, to try and show that all sensible people support Remain, and let the sheer wildness of the Leave campaign sow the seeds of doubt, and allow them to play on the minds of Brexit inclined voters, so they then fail to turn out, or even change their minds. This blog does not presume to advise on this choice. I am not in close to or in sympathy with the decisive group of voters; my advice on Lib Dem electoral strategy, notably in the European elections of 2014, was well received but wide of the mark. These are scary times for those of us who feel that a British vote for Brexit would be a catastrophic result for the country, and a betrayal for what it has stood for since so many of our ancestors died on European fields 100 years ago. Posted on June 1, 2016 Author MatthewCategories Politics UKTags EU referendum2 Comments on Brexit is winning the referendum campaign: what should Remain do? First an apology. I haven’t been posting much on this blog in the last few weeks. This is for two reasons. First life is intervening, in the form of school governance duties and London election work (administrative rather than political). But also because I am experiencing severe performance problems with my website, which are entirely mysterious to me. Having tried a number of things I have now migrated to a new hosting company which is both cheaper, and billed as a WordPress specialist, and so better able to provide the technical support I need. It does seem to be working better already. Strangely enough yesterday I had an email from my old hosting company (5Quid) to say that it was being taken over by my new one (TSOhost) and would be migrating anyway. It may help that I have got in first. Still I now feel free to post again. The big political story of the moment is the referendum on Britain’s membership of the EU, which is due on 23 June. I want to offer thoughts on how the campaign is faring. The first thing to say is that it is not an edifying experience. I have heard it suggested that regular public referendums help educate the public on political issues. That may be the case in some countries, but it is not how it works in Britain. I learnt that from the 2011 campaign on the Alternative Vote. No argument was too spurious to field. The public found the “raucous” mudslinging enjoyed by the press more engaging than any attempt to grapple with the issues. Public understanding of electoral systems advanced not an inch; even quite respectable, educated people still say that it was all about proportional representation. And so it is this time. No argument is too spurious. Much easier to tackle the man rather than the argument. It is in this context that we must judge the progress of the two camps. Leave scored an early goal when two senior Conservatives, the Justice Secretary Michael Gove and the London Mayor Boris Johnson came over to their side, after rumours that they wouldn’t. Personally I find it hard to take either of these politicians seriously, but they are clever men, and have followings. They gave the Remain camp respectability and gravitas (in a funny sort of way with Mr Johnson – but he’s a serious politician) that they other wise lacked. Leave scored again, in my view, with a coherent and well-chosen core message in the first weeks, supported by some effective sound-bite arguments. This is quite remarkable since their campaign was and still is the more chaotic, with rival camps eager to dominate the argument. This shows some strong political instincts on their part. Their slogan “Take Control” gives a reassuring flavour to their proposition, in spite of it leading the country into a daunting political space. Two soundbite arguments stand out. First is that the gross contributions made to the EU (alleged to be £350M a week) could easily be spent on other things, specifically the NHS. This is nonsense of course, since most of the contributions come back into the economy in one way or another. Spending the money on the NHS would mean taking it away from farmers; the contributions end up being spent several times over with this sort of reasoning. And, of course, the financial effect could easily be swamped by bigger economic developments. No matter; all this requires explanation, and nobody is interested in stopping to listen to complicated explanations. The second soundbite argument is a more defensive one: which is that the UK’s trade deficit with the EU means that the UK can dictate trading terms, because otherwise those German exporters would get upset. Of course that only lasts as long as the trade deficit itself – and don’t we want to fix that? Even so, in the first weeks of the campaign this line of argument has been quite effective at neutralising Remain’s claims that the country will lose access to EU markets. Meanwhile, Remain’s efforts seemed to fall flat. They tried to promote the idea that there would be short and long term damage to the economy. Leave called this “Project Fear” , which I thought was a mistake (drawing attention to the opposition’s claims), but it seemed to do the job. Steadily the polls started to drift Leave’s way. They had started with a Remain majority (which undermines my football metaphor a little – perhaps the campaign should be looked at as a return leg with Remain already 2-0 up from the previous one). A week or two ago the polls looked neck and neck – though phone polls (usually considered more reliable) showed a Remain lead, this was shrinking. But this week Remain have pulled a goal back. This came with a weighty Treasury report suggesting that the economic costs to the UK of leaving, short and long term, would be very high indeed. The convenient headline figure was £4,300 per family – no doubt just as spurious as Leave’s headline numbers, but what the hell? This wasn’t news particularly, but it seems to have struck home. Why? Well it was weighty, and more objective observers, such as the FT’s Martin Wolf, consider it to be fundamentally sound in its analysis. But it also laid out in stark clarity the disadvantages of each of the various alternative trading arrangements. Again this is not new, but it had authority. It is the strongest intellectual argument for Remain, since each of the alternatives either has mighty drawbacks, or leaves you wondering what the point of leaving the EU would be, if you are still paying contributions and signing up to free movement of people. Remain’s next step will be to use US President Barack Obama’s forthcoming visit to promote his support for Remain. Mr Obama has star quality in this country, if not his own, and it will undermine the optimistic picture painted by Leave of life outside the EU. Leave are already panicky about it, suggesting his views are hypocritical because he would never recommend restricting US sovereignty. But that is to suggest the countries are equals; in fact Britain is roughly the size of California economically; it is universally understood by Americans from Mr Obama down the California is better off in the USA than independent. Remain should score the equaliser. The polls are already moving back their way. But it’s not over till it’s over. Leave can certainly pull the contest back. Their strongest suit is the country’s anxiety over unrestricted migration from EU members, which can be used to promote all kinds of fears, from job security to terrorism. This is a genuinely open contest with at least a third of voters are not truly convinced by either side. And we haven’t even reached half-time. It’s often said the Britain’s referendum will be decided on emotions rather than facts. Well facts belong to the past, and the referendum to the future, so perhaps that is as it should be. The critical question is about the sort of country we want Britain to be. There is a difference between factually based opinion and raw emotion – but usually the former is just a tidy veneer on the latter. Our attitudes are driven by who we are, amongst the middle classes anyway. There is clearly something cultural about it. It is very striking that amongst my friends and family, those with whom I feel able to talk about politics, the almost universal wish is for the country to remain in the EU. I have been politically active in the Liberal Democrats and its predecessors for 35 years, so perhaps this is not surprising. But it includes people who support Labour, the Conservatives and the Greens too. It also spans a wide range of ages; it is an issue where the younger generation agrees with its parents. Who are we? We are middle-class, usually university educated, professional, civically minded, and political and social liberals. We hold a wide range of shred beliefs about the world, which go beyond the EU, including, for example, a belief in man-made climate change and the priority to reverse it. And middle class folk who take the Brexit side, whom we hear every morning and evening on our radios and see on TV, are the fellow-citizens whom we most detest. We view them as self-interested, greedy hedge-fund managers and businessmen, or the sort of annoying intellectuals who take pleasure in disrupting consensus and ruining any kind of cooperative progress. Interestingly, from what I can make out, the Brexiters view us as the soft-minded, cosy consensual ruling elite, and themselves as the brave tellers of truth to power. They reject a whole range of our beliefs, including climate change, or what to do about it. Funnily enough, we Remainers, most of us, don’t feel that we rule anything more than school governing bodies, and we feel besieged. Indeed we trust our ruling elite so little that restricting them with constitutions and systems of rights seems to be a good idea. We don’t think that driving out he EU means taking back control – just handing it to an even smaller elite whom we distrust. The “elite” is always somebody else. I think that this clash of values is based on civic-mindedness rather than liberalism. Many of the Brexit middle classes (think of Douglas Carswell the Ukip MP) have a basically liberal outlook. They like engaging with foreigners, are socially liberal, though some struggle with the idea of cultural diversity within their own communities. But they invest more effort in self-promotion, or individualistic activities, as opposed to cooperative, or civic ones (being school governors, helping at the church, and so on). Of course many Brexiters take part in civic activities, like supporting their local Conservatives or local business networks – but these seem to have a strong self-promotion agenda. People who join the Lib Dems after being with the Conservatives remark on how different, and less dominated by personal ambition, the culture is – though the Tories have many civically-minded people in their ranks too. The idea of individualism against cooperation seems to be the central one. Individualists distrust government structures, and struggle to understand the point of cooperative ventures like the EU. Some think the EU is a plot to establish control over our lives by a shadowy elite. One such is the pseudonymous Alexander Niles, whose latest book on Europe I was asked to review. But it was so paranoid as to be unreadable by somebody not already in sympathy with that way of thinking. Cooperative ways of working seem simply to be beyond the imagination – they are either futile and ineffective, or a cover for a hidden elite, covering their tracks with lies. And yet to many of us cooperation (and attendant compromise) is the very essence of how a complex society must operate. And the process of engagement with others often gives us energy. We are disposed to like other people rather than despise them. We are slower to condemn people as fools. What has this to do with the EU? It is in essence a cooperative organisation, of course. That gives it permission to exist in the view of cooperativists, but it does not necessarily justify it. There is something about freedom of movement, and the right to go to another part of the continent and take many of our civic rights with us – or invite people from other parts of the continent to join us- that we like. We feel this openness is the surest path to human progress. It expands our horizons. And European-ness is part of our identity – it is particularly useful in setting us apart from Americans, that nation of individualists whom we struggle to understand. If the polls are to be believed, we cooperativists outnumber the individualists in Britain’s middle classes – there is a solid majority for Remain in social groups A and B. But the vote will be decided elsewhere, by people with a very different outlook. Traditional working classes, a dying breed, but with a substantial hinterland of retirees and victims of economic advance, are disposed to vote to Leave. The arguments and passions of the middle class Remainers will cut little ice. They are not culturally adventurous; freedom of trade and movement seem more threat than opportunity. I suspect that the decision rests a new working class of service workers, whose jobs are often insecure, but for whom opportunities remain. I’m thinking of the “new affluent workers” and “emerging service workers” from Mike Savage’s recent book on class. These are more culturally diverse and adventurous than the traditional working classes, but less secure than the middle classes. They may worry that free movement of people is a threat to their job security or pay; they may also fear the damage that the disruption of leaving the EU is likely to wreak, even if it is only for the short-term. We, the divided middle class, rehearse our arguments about the EU in front of this decisive audience. But neither of us really understand what will make up their minds. And it really is very hard to see who will end up on top. Why isn’t the sovereignty argument for Brexit making traction? Thank you to Politcal Betting’s Alistair Meeks for giving me the idea of using Maslow’s hierarchy of needs to offer insight to Britain’s referendum on whether to leave the European Union. It poses an interesting conundrum about the campaign for a Leave vote. Maslow’s hierarchy is old-fashioned psychology, which has no doubt been left behind by practising psychologists long ago. But it contains enough truth to resonate with political analysts. This hierarchy is presented as a series of layers, usually visually presented as a pyramid. At the bottom are physiological needs (food, shelter, etc. ); at the top is “self-actualisation” – the higher needs of confident people. 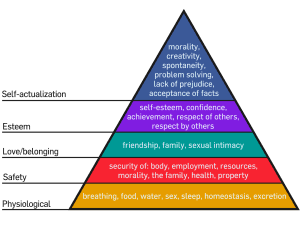 The idea is that while needs are unmet in lower layers of the hierarchy, higher needs will count for little. People won’t worry about safety if they are starving, and so on. The political message is that high-flown arguments about democracy and freedom will not appeal to people unless more basic needs and fears have dealt with. Mr Meeks puzzles that many Leave campaigners are obsessed with the European Union, and its supposed effects on national sovereignty, and yet the EU hardly registers in lists of important issues identified by ordinary voters. It is trumped by issues such as the economy and immigration, which speak to needs (security and, perhaps, belonging) that are lower down the hierarchy. But the puzzle doesn’t end there. The Economist’s Bagehot column points out that there is a great educational divide in attitudes to the EU, and uses two nearby cities to illustrate the point. Middle class, well-educated Cambridge is strongly for Remain; working class Peterborough is the opposite. And here’s the puzzle: it is the middle classes, much further into self-actualisation level, to whom the standard Leave argument about sovereignty should appeal. And it seems to be having little or no impact there. And that is not from lack of exposure. For the last five years people on BBC Radio 4 have been banging on about it, and not just in news programmes. Arch Eurosceptic MP John Redwood presented an Analysis programme on Europe; conservative philosopher Roger Scruton majored on it in one his Sunday morning point of view programmes. And it has been repeated endlessly in the last week, most notably by Conservative cabinet minister Michael Gove, usually reckoned to be a thoughtful type, as well as the more opportunist Boris Johnson, London’s Mayor. And almost no argument has been offered against the idea that the EU is an outrageous assault on British democracy and in effect a foreign dictatorship. Instead responding Europhiles quickly migrate down the Maslow hierarchy and talk about jobs and security, or pick off relatively minor points, such as challenging the figures on Britain’s budget contribution to the EU. And yet for all the apparent one-sidedness of the high intellectual debate, Remain seems to be winning at the top of the Maslow pyramid. I think that is because there is a massive disconnect between Leave campaigners and members of the general public on the nature of Britain and democracy. Mr Gove paints a picture of a proud history of the British freedom and democracy, against an EU that has achieved little and is stuck in the past. He wants laws made in Britain, by lawmakers the British people can throw out if they don’t like them. But it is all very well for Conservative MPs holding safe parliamentary seats to wax lyrical about British democracy (and to talk aggressively about throwing the blighters out – a very distant prospect I their own personal cases…), and decry the limits that the European treaties place on their exercise of power – but ordinary people, even nice, educated, middle class ones, don’t feel connected to their lawmakers. They distrust their parliamentarians, and aren’t sure that they actually would be “thrown out” if they didn’t like them. Indeed when it comes to elections, the same politicians delight in suggesting to electors that they have no real choice at all – vote for them or for chaos. And don’t waste your vote on Greens, Liberal Democrats or Ukippers. Many voters are persuaded to vote for people they don’t really like or trust, for fear of something worse. It is hardly surprising if people have rather more nuanced views about British democracy than their elected representatives. This is all reinforced by standard political wisdom. Democracy is not supposed to be elective dictatorship. Hitler’s attack on minorities and opponents was not legitimated by the fact that he had a mandate from an elected parliament. As the Americans appreciated from the start, freedom and democracy is about checks and balances. And there are frighteningly few of these against the British House of Commons, whose majority, these days, is based on the votes of about a quarter of the electorate. The European Union presents one of the few remaining checks, and usually for reasonably sensible things, like protecting the environment, ensuring public procurement isn’t stitched up, or that there are some standards of job protection. These regulations may not be especially loved, but they offer some bastion against our own politicians, especially Conservative ones, who celebrate the freedom of employers to sack people at will, and landlords to do as they please. The EU is not imposing taxes or calling up our young people to serve in a European army. This “dictatorship” has a rather muted impact on our daily lives, it turns out, which well be rather benign in the long run. There is another problem with the sovereignty argument. What is so special about the British level of polity? Mr Gove is annoyed that French or German politicians have a say over our laws. But don’t Scots voters feel even more strongly about the say of English Conservatives over theirs? Why should London voters have so much say over what goes on in Manchester or Cornwall? Politics is clearly a much more complex business than is being made out. It is interesting to deploy the arguments of Messrs Gove and Johnson to the question of Scottish independence. And to note that to most Scots the EU does not look like an instrument of foreign oppression. Furthermore, many middle class voters may be rather less than convinced that the rest of Europe is such a bad place that we should have nothing to do with them, or (a longer shot) that the EU has achieved nothing. Things seem to work well enough in France, Germany and Austria – and even in Spain and Italy. The EU’s mission to extend democracy and the rule of law to south and east Europe may not be entirely successful or complete, but surely it is a worthy cause? And surely the most important moments of British history, from Waterloo to the First and Second World Wars show that what happens over the Channel affects us deeply. Europe is where Britain belongs, surely? This is not to say that there are not many insecurities that the Leave campaign can play on, especially amongst working-class Britons. These, especially including fears over immigration, may yet win them the referendum. But banging on about sovereignty is unlikely to help them much. Posted on February 25, 2016 Author MatthewCategories Politics UKTags EU referendum3 Comments on Why isn’t the sovereignty argument for Brexit making traction?